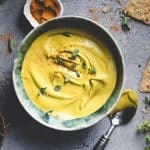 This recipe for coconut curry hummus adds a flair of spice to my favorite extra-creamy hummus recipe with garam masala and coconut oil. My original hummus recipe is still a favorite go-to. I make a big batch and it will last a week for random snacking, schmearing on sandwiches and, my personal favorite, as an addition to a hearty salad. The secret to super creamy hummus is adding baking soda to the soaking process and again to the cooking process. It interacts with the dried chickpeas to break them down so that when you blend them in the food processor they become extra soft and creamy. I always use my Instant Pot Pressure Cooker to cook the beans for this recipe. I much prefer using dried beans to canned from a flavor standpoint. If you don’t have a pressure cooker, I have the alternative stovetop directions in the recipe below. If you would rather used canned beans, feel free, just omit the extra soaking water and baking soda from the recipe. I decided to riff on this recipe by adding a little Indian inspired flair with coconut oil in place of olive oil and garam masala and turmeric for color and flavor. When you read the recipe you might think, “but that’s not enough oil!” Don’t worry, if you use the baking soda trick, the creaminess comes from the chickpeas and the tahini, not the oil. One note with this recipe is that the amount of water you add to it will probably vary based on your taste. Some people like their hummus thicker, others thinner, so it’s up to you. Just add more water if it’s too thick and you’ll be in business. Our family of four will polish off this recipe within a week without any signs of spoiling. Keep it refrigerated in an airtight container for up to seven days. An easy, extra creamy recipe for homemade hummus with a coconut and curry twist. 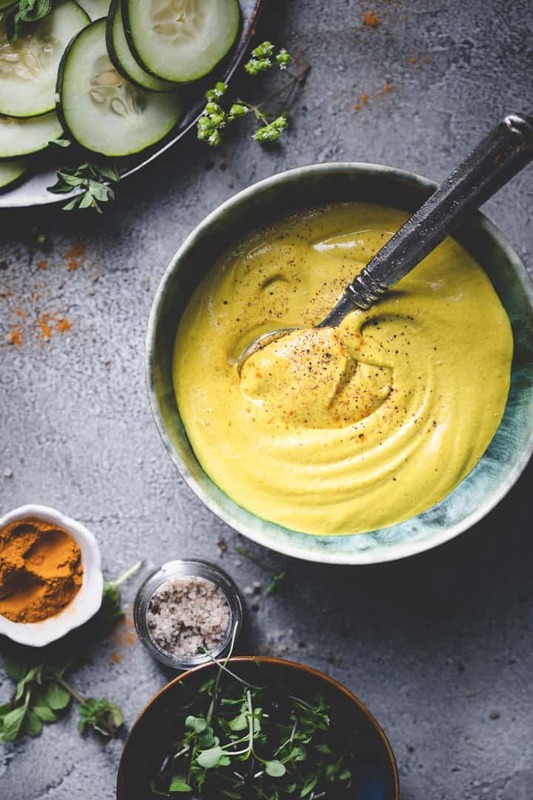 Add the beans to a food processor with 1/2 cup tahini, 2 – 4 tbs lemon juice based on taste, 2 tbs oil, salt, spices and start to blend, slowly adding in additional water until the hummus it the consistency you like. Adjust water and salt until desired flavor and texture.